We need Davinci Jenny Lind crib parts for a Jenny Lind crib that has been painted. When it was painted the model/product number, serial number, etc. were all painted over. We would like to know what size and type of screws we need to reassemble the crib but we are unable to answer the questions asked on the form on the DaVinci website. 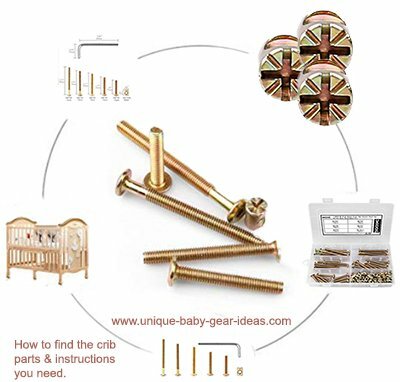 Go here to find screws for Jenny Lind and other baby cribs. We can't provide place an order because the panel with the required info has been covered with paint. Any assistance or suggestions as to how to deal with this problem would be much appreciated! If anyone has any suggestions as to how we can order the screws we need from Davinci Furniture without the exact model number, please contact me using the space below (and PLEASE include your contact information in case I need to get in touch with you!). Unique Baby Gear Ideas encourages our visitors to share suggestions as to how to order parts from DaVinci lacking a model number. Have you thought about contacting customer service and asking if you might email a picture of your Jenny Lind DaVinci crib to them? Davinci might be able to identify the crib from the photo.